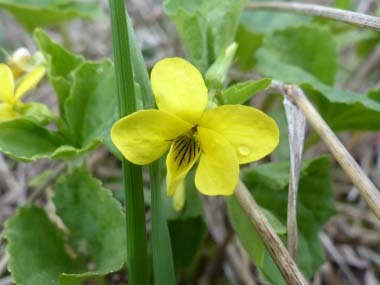 The Downy Yellow Violet is divisible into two varieties which may be distinguished as in the following key. The nectar and pollen of the flowers attract primarily bees and less common insect visitors include small butterflies and skippers. Distinguishing Features: This is a soft hairy violet that can reach up to 9-12” tall. 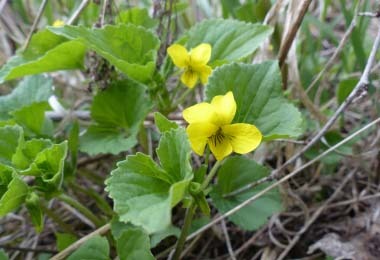 The bright yellow flowers, veined with purple or brown toward the throat, grow on leafy stems above sturdy green foliage. 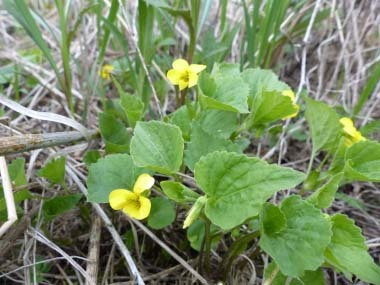 Among the numerous yellow violets, the hairy nature of this species is usually distinctive. Flowers: Flowering is from early May (or rarely the last week of April) through June. Flowers are about ¾ inch across, 5 yellow petals with several purple or brownish lines on the lower petal. The side petals are bearded with short hairs on the inside near the base. The flower is at the end of a stem that arises from a leaf axil. One plant can have several flowers. Fields of Nutrition has medicinal benefits and vitamin/mineral content of Downy Yellow Violet. Leaves: This plant has basal leaves, growing alternately on the stem. Basal leaves are broadly heart-shaped, to 3” wide and 2½ “ long, with coarse teeth or scalloped edges and hairy leaf stalks about 3” long. The stem leaves are a little smaller, more elongated than broadly heart-shaped. The undersides of leaves are usually covered in short hairs but may be smooth. 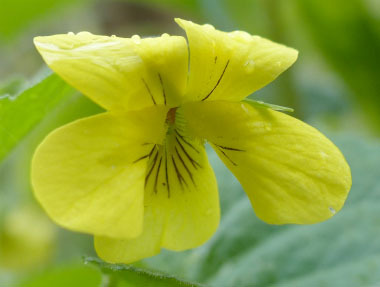 Height: Depending on growing conditions the downy yellow violet can reach up to 9-12” tall. 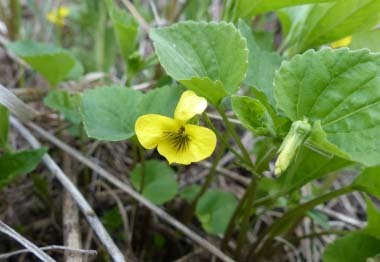 Habitat: This native violet is common in nearly all areas of central to eastern Canada and U.S. It also grows in the temperate regions of Europe and Asia. Habitats include moist to mesic deciduous woodlands, woodland borders, and thickets. Interestingly, it was once cultivated in Europe for the purpose of detecting an acid or alkali. Edible parts: Flowers and leaves are edible. The root has been used in the past for medicinal purposes. Similar plants: Common violet, White violet.